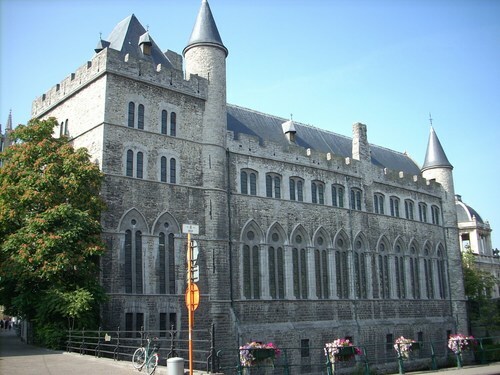 Until the early part of the 19th century male lunatics of Ghent were confined in the dungeons of the Geerard de Duivel Castle, in the centre of the city. Then, thanks to the work of Joseph Guislain and the Brothers of Charity things became more human as they took care of the insane of the city in the new Psychiatric hospital1. Photo by Luca Borghiti.supmacinu|ihgrob.l# | (August 2009). The name of the castle, "The Geraard van Duivelsteen castle", is a bad translation toward English from the original name "Het Geraard de Duivelsteen". Geraard is a common first name in Flanders and France. Duivel means devil, and Geraard de Duivels has to be translated in English as Geraard the Devil. The word "Steen" means "medievil fortification", later called castle. So the picture shows us "The Geraard de Duivelsteen" or "The Geraard de Duivel Castle", but not "The Geraard van Duivelsteen Castle". Changed page title according to useful advice received! 1. See R.Stockman (ed. ), Neither Rhyme nor Reason. History of Psychiatry, Dr Guislain Museum, Ghent 1996, pp. 77 and 86.